Tyson is a famous male greyhound that was a stud dog. He has 39 pups listed so far, with more on the way. He was a great racer that raced AA at Wheeling in West Virginia and competed in Stakes Races. 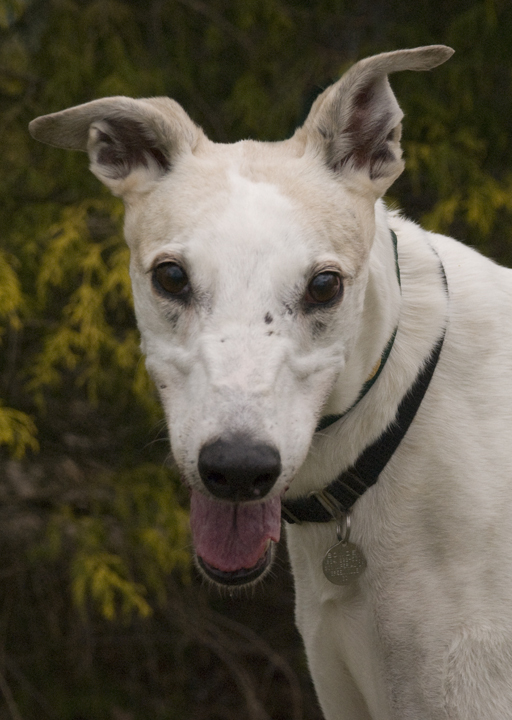 He was the favorite greyhound of his owner because of his wonderful, friendly personality in addition to being a champion racer. We are thrilled to be able to meet Tyson and to be trusted to find him an adoptive home. Whoever adopts Tyson will be adopting a wonderful dog and a piece of racing history. His name will be in many pedigrees of racers of the future. Tyson's sire is the famous Jimbo Scotty and his dam is Concerto. He just turned 11 on June 5th. He is a wonderful dog that is doing great in foster care. He has mastered the doggy door and goes outside to potty. He is great with the small dogs in his foster home and has been good with the kids he has met. He is a very calm, sweet, well behaved, older guy. Because he is a senior Tyson qualifies for our reduced adoption fee of $200.